Beautiful bright studio with garden and private access in a prime central city location for up to 5 people. The apartment is located in one of the most beautiful quarters of Hamburg, in a quiet location. 5 minute walk from the Hills district. The U- and S-Bahn, which city bikes and taxi stand are only 2-5 minute walk. Cafes, bars and restaurants Supermarkets are located nearby. Arrive and feel good. The 82sqm studio has a 12sqm bedroom for 2 people and a gallery with sleeping facilities for up to 3 people, a living-dining area combined with a fully equipped kitchen and bathroom shower and daylight. Throughout Floor area wood flooring was laid. The outdoor area invites you to Cafe or dinner. Nice apartment with many windows. Very comfortable for me, my wife and 12 YO son. Plenty of space. Nice neighborhood and pretty quiet, even with all windows open. 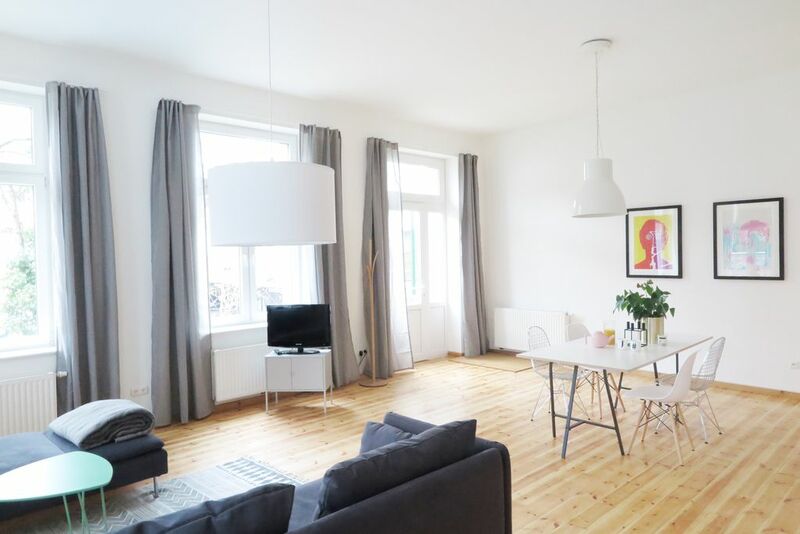 Patrick's apartment is in a great location with easy access to U Bahn and city centre. The apartment is large and airy which made it ideal for our group of friends. We stayed here (family of 4) for 3 nights/4 days and it was great. Fabulous apartment - and great neighbourhood that was very central yet felt like a very local area and not at all touristy. Wonderful bars/restaurants - very urban which we liked. Would definitely recommend the apartment and the owner was very helpful. 5 stars! Quick easy access to great restaurants and shops, yet the apartment is very quiet. Five minute walk to grocery store and ten to U Bahn. Really cool neighborhood. Unser Aufenthalt in der schönen und toll gelegenem Wohnung war perfekt. Der Vermieter ist sehr sympathisch und unkompliziert. Due to its own access with garden, the studio is very family friendly. Due to the proximity to the underground and railway no car is notwending. Who likes to go on foot almost achieved everything within a radius of 3km.